The late Louis Awerbuck taught that surviving a gunfight is 95% luck. You just can’t control the suspect’s skills, cunning, or the stray bullet that has your name on it. You may react perfectly, tactically moving as you empty a magazine into the suspect’s vital areas, inflicting mortal wounds with each round. But in his dying reflex, he may fire and fatally wound you—and, unfortunately, all ties in a gunfight go to the suspect. Control in a gunfight is limited. Within your purview of control are only the preparation of the skills and knowledge you bring to the fight, your decision-making within the law to respond early enough to make a difference, and your ability to control your emotional reaction to the attempt to murder you. The mechanics of hitting a target is important. Skill development involves a moderately reliable level of accuracy on a square range rather than focusing only on tight groups. Teaching officers deadly force policy and the laws of defense of self and others should be a mandatory component of every training session—not just reading the policy or law but actually digging into what it means. Ease in the application of the law and policy combined with the early recognition of the deadly force threshold can be gained by applying the gained through force-on-force drills and scenario training. However, this preparation alone is apparently insufficient given the low rates of hits on suspects in many close-range shootings. Fundamentally, the ability to reliably put bullets through a suspect who is attempting to murder the officer is as much about controlling emotions and overcoming fear as it is about skill alone. Perhaps more. All deadly force training and, indeed, all force and tactical training must address the emotional component of responding with force to prepare the officer to meet the combative needs of the job. The survival strategy of "Freeze, flight, or fight" is inherent in all mammals. Prey animals freeze because many predators key on movement. Like our mammalian counterparts we, too, demonstrate the same survival strategies. Everyone freezes to some degree when the unexpected happens—think meerkats at the first hint of alarm. It takes time to orient to the new situation. We tend to stop moving, hold perfectly still, and look in the direction of the alarm. The next natural response is flight, or fleeing from danger. Fighting tends to be the last response of prey animals and is also the natural last response of untrained non-sociopaths. Training can change this, but only if the training is relevant to its application in the real world of threat. Effective police training creates the ability to quickly transition through the freeze state into the fight. This rapid reaction is necessary for many of the threats that officers face in the street that are in-proximity and unexpected. Highly experienced military operators say surviving a gunfight is more about controlling emotions than it is about raw shooting ability. How we train officers through the entire range of skill responses, both on the range, in scenarios, and in the mat room creates the possibility of rapidly transitioning through the freeze and flight responses and into the fight stage where it becomes possible to prevent injury and death. And it is not simply more reps or more rounds fired downrange that constitutes a trained individual. Having sufficient experience to automatically respond to imminent threat means you have had the good fortune to have lived through enough threatening situations that your dominant survival response is to fight. For the rest of us mere mortals or the inexperienced, training must assist us in transitioning through that fear response to a functional level of skill competency. First, recognize that freezing in the face of sudden danger is not a character issue. It is an emotional issue that must be over-written by a more positive or, put better, a more effective emotional response. A tiny portion of the brain, the amygdala, acts as the first filter of external stimulus entering the brain. Even before we consciously recognize something, say, a thin, long, coiled shape on the ground as we turn a corner, the filter of our amygdala causes us to jump back and away well before our rational brain recognizes it to be a coiled hose rather than a dangerous snake. The amygdala is the first filter we have to quickly alert us to danger. It is not reasonable nor is it rational. It simply interprets a possible danger and sends an alarm to which the body reacts. It creates emotional integration and learning through association (associative learning)—it is a key part of how our memories embed and are retrieved from long-term memory. It is able to learn through reward (pleasure or not being injured) and punishment (injury or unpleasant consequences). In the training environment, the training of our officers’ amygdala response prepares them to transition through the fear and better apply their skills when responding to sudden threat. In the training environment, it would be immoral to place officers into a situation where they might actually die to retrain the amygdala. All training, including the best scenario experience, has some degree of falsity—everyone knows they are not actually going to be shot or stabbed by the suspect/role-player. How can we override the emotionally-based fear response that degrades actual performance if we are unable to duplicate the fear they must face in real life? Pushups and running sprints don’t do it. Being yelled at by up-range instructors won’t either. We do this by mimicking the body’s fear response. Emotional responses (via the amygdala) create changes to the body’s systems. Fear causes physical alterations to cortisol levels in the blood, heart and breathing rates, blood distribution, vision and hearing, muscle tone, and ability to digest food. It can result in the bladder and/or bowels involuntarily voiding. It also creates psychological changes in pain tolerance, attentional focus, cognitive flexibility and adaptation, as well as memory and perceptual distortions. When we become truly fearful, our emotional response changes our physical body and mind, affecting our ability to apply the skills we have so carefully built. Your eyes go wide and your pupils dilate to gain as much light as possible and jerk your head to face the source or direction of that surprise or threat. You gasp, taking in a sharp intake of air. This is the body preparing for flight or fight. Most people will hold their breath following the initial gasp (remember: stillness). Your body moves, orienting your chest to that threat as you take an athletic stance (much like a linebacker, with your dominant-side foot back a bit), your body has a slight lean forward from the waist. Your body actually drops a bit, lowering your center of gravity. Your hands tend to come up to face level, palms out, your non-dominant hand slightly forward. Your shoulders rise, moving up and forward while your chin sinks a bit to better protect your extremely vulnerable throat and neck. The reciprocal of that process also holds true: mimicking the physical response to sudden threat—the startle response—activates to some degree the amygdala’s emotional fear response. Emotional reprogramming can take place by mimicking the body’s reactions to fear. By taking in a sharp gasp, suddenly opening your eyes wide, while jerking your shoulders up and forward and quickly lowering your center of gravity, most people experience a slight to moderate cortisol (adrenaline) reaction. While some officers are too salty to try this, the large percentage quickly identify that there is an element of validity to the concept of duplicating in training the emotional environment where skills application intersects with the existential fear experienced in the street. For example, in our range training, we ask you to close your eyes and imagine the face of the last person you thought was going to kill you. Every cop with a few weeks of street experience can conjure up this person's face. Rather than paper targets, this is the person the shooter is shooting in response to their imminently threatening actions. We then ask each person to explain or demonstrate what that imminent threat is doing to cause him/her to shoot the suspect. Upon every initiation command of "Threat!" (short for "imminent threat," or that action by the suspect to which the officer is legally justified to respond with deadly force), the officer is directed to take a quick, sharp intake of breath, jerk his shoulders up and lower his center of gravity. This physical action creates an emotional tie (and a small adrenaline cocktail dump) to the response (hit the threat). The mind associates sudden threat with moving, drawing, and hitting the suspect rather than freezing as a survival strategy. Same-same in Defensive Tactics. During some of our drills, we will have the coach (not the "suspect") begin a monologue in a low, menacing voice of how this coach wants to kill the officer and how they're going to do it. At first, many officers react with fear (strange how in a safe environment with someone that officer KNOWS won't harm them, yet the brain reacts with a degree of survival emotions and fear). Just this monologue often causes the officer to speed up or become inappropriately intense. So instructors begin to coach these officers to calm down, to breathe, to focus on their skills as the coach continues his/her threats. Soon the officer is able to over-write previous programming and work comfortably with the coach. Then we change coaches’ instructions to produce a low, menacing, animal-like growl. We see officers instantly ratchet up in intensity, eyes-wide, breathing faster than the physical requirements demand even though there's no change in the intensity of the coach working with that officer. Again, instructors coach them to breathe, to work at speed, to continue to problem-solve and function effectively. When the officer is able to calm down and work through the growling, we then have the coaches begin shrieking insanely. Officers often instantly seize up emotionally and physically, and are again coached back to effective emotional response—and reasonable physical response. Incorporating this emotional integration into all aspects of training pays off in scenario training where, if the officer hitches up, we hit the pause button, and talk privately about not only what that officer is seeing but, as importantly, what he/she is feeling. If the officer is unable to identify his or her emotional response (or unwilling to share it), the instructor then describes what it looked like from the outside, how that emotion is negatively affecting the officer’s performance, and how to take the steps to counter it. We then rewind and continue to replay the event where the emotionally charged hitch occurred, with the officer taking that sharp intake of breath and bodily reaction to simulate being startled, until the officer signals that he/she can continue on without undue or negative emotional reactions. We then rewind and play forward toward success. The exercise was halted and he removed his protective mask. He was breathing as if he’d run a world record mile up stairs. His face was pale and he really couldn’t articulate what had just happened to him. We removed him from the exercise and talked about what he experienced. Embarrassed, he literally had a blank spot in his memory. Other than he knew he had been hit a lot, it hurt, and that meant he was dead—he had no clue what his physical response was. Helping him to emotionally reprogram is the key. This officer’s response was not due to a lack of skills or deficiency of character. It was due to an overwhelming and inappropriate emotional programming. So we went back to the foundations of programming a positive physical response within his emotional experience. Intellectual foundation. This is a combination of reinforcing his understanding of "Early Orientation Markers,"© or what threatening behavior looks like and how the body moves when the suspect is obtaining a deadly weapon or about to initiate an assault. It covered in depth the legal/policy basis for response. It also provided tactical suggestions such as movement and why that is often beneficial. Emotional reprogramming also included a discussion about mimicking the body’s startle response in training and why that was important. Scenario exercise. The officer was able to complete the scenario satisfactorily. Cops aren’t machines, even though most of the training they undergo treats them as if we just need to give them the correct number of parts in a specific sequence and all will come together in a combative environment. Human beings are far more subject to their emotional programming than many care to admit. Every person has some aspect of his or her life where their emotional fluency hampers their effectiveness. When this negative emotional programming intersects their ability to competently respond with their skills on the street, it endangers their lives and the lives of officers and citizens. Creating a training environment where each officer is able to condition themselves to operate competently through drills where the normal emotional response is tied to the proper physical reaction assists them in responding competently in dangerous, high-risk situations. By simulating the physical response to overwhelming emotions, officers are better able to function and win. There is always a lot of complaining by police defensive tactics instructors that officers don't like to train and there is not enough time to train to gain a high level of competency in DT. They argue that these skills are highly perishable and without frequent and recurrent training, there is no way to build capability in the average officer. There are two ways of gaining expertise and overcoming the problem of perishability in high skill training. Sufficient training time and commitment to instill in the schema those highly evolved movements and skills is but one way. Training time is expensive and many agencies struggle to meet minimum staffing for their shifts. Intensive, recurring training requires either high budgetary commitment, high personal effort and time commitment, or both. The other way, within current budgetary constraints (and reality), is to provide training the officers will use every day, thereby gaining OJT (on the job training). If principle-based training is indeed primally hardwired into our human blueprint, then EVERY TIME a police officer puts hands on a subject, that principle-based training is reinforced (in essence, practiced). For a simple example, a not-yet resistive but nominally non-compliant subject is not going along with the program and the officer is legally justified to put hands on him. The officer step in at an angle (Principle of Combatives: Step in angles and circles), takes hold of the subject’s elbow (Principles of Combatives: Constantly target seek and Always put reasonable weapons to reasonable open targets), and then likely presses the elbow against the officer’s torso (Principle of Combatives: Put body parts to body mass—or closer-stronger). Now the officer moves his/her body and the suspect must contend with his elbow being affected by not only the officer’s strength but also the officer’s weight. Greater level of success and effectiveness. How did the officer know do to this? Because the officer learned through Universal Principles of Combatives drills that they gain success through grabbing the elbow with both hands and pulling the elbow into their body rather than playing wrist games and control holds with suspect which is generally ineffective against someone of similar size and strength who doesn’t want to play with the nice officer holding his arm. Soon, everything the officer touches is pulled into their bodies (or their bodies go to the object/limb/suspect body part) as a matter of habit with little or no thought because the officer is stronger and more effective, gaining a history of success that pays off when one day the suspect draws a gun and shoves it into the officer’s chest. The officer immediately defends by slapping and then does what? Grabs the gun-arm and pulls it into his chest (paying attention to the muzzle direction). Then the cop solves the problem however that looks for them. So every time the officer puts hands on someone to arrest, to control (a false concept, BTW), or gets into a small tussle or big fight, the primal blueprint is reinforced and solved through the Universal Principle of Combatives. OJT serves as a primary training vehicle as each officer problem-solves through the day, discovering what works and what does not for THAT OFFICER. Work becomes the repetitions necessary for greater mastery and a source for unconscious competence because there’s little to “remember” and perform other than just doing what my body does before big, strong, athletic, uninjured, well-trained men taught me how to fight like them. Instead, when it is relevant and you can gain success that fits your physical, mental, and emotional needs in that very scary situation where not only can you be injured or killed, but your personal reputation as a cop is on the line, then training becomes something you can look forward to. If your cops are avoiding DT training or showing little enthusiasm while on the floor, maybe look at the program you are teaching and not at them. Not a single cop I’ve ever met in 33+ years went into LE not wanting to be well-trained. We, instructors, turned them away from training. When we provide relevant training they can be successful with, that changes their enthusiasm. They actually look forward to training and become willing to make efforts during instruction because they know it will work on the street for them. How does an instructor, much less an agency or even an industry change from teaching ineffective, prescriptive, and technique-based defensive tactics training to one that comports with the recent research into human factors and the need for principle-based training? It first begins with growing as a person and an instructor, and changing the concept of what an instructor is in relation to the students. However, this change from technique-based training where the instructor is the go-to authority and transitioning into principle-based and student-centric problem-solving is fraught with huge obstacles for the individual seeking to change, much less changing an industry's orientation to DT. I began by teaching cops a martial arts-based DT program. Shockingly, I soon found veteran cops looked no different than white belts and progressed at the same rate of expertise requiring years of dedicated training they didn’t have. I'd been experimenting with foundational principles asking myself if was there a commonality between the conceptual foundation within the essence of techniques? So I began a trial and error process with rudimentary understanding of principles. A refinement process of the program took place over years that wholly challenged my entire orientation to what I was doing. It required me to step completely outside of the comfort and personal egotism of being THE authority and TEACHING THE ANSWER. The truth is, I knew down deep it wasn't THE answer because they--hell, I couldn't--apply the technique in real life against a real person who wanted to hurt me. The first big breakthrough came when I attempted to defend against a subject who was under the influence of PCP into custody. NOTHING worked (all of you who have had this experience just smiled knowingly). He left in an ambulance with six broken bones and a knee and elbow that needed surgical repair that he didn't notice. This fight took minutes and left five of us bent over breathing hard with rubbery muscles. That was my come-to-Jesus moment about techniques and fighting. In that fight I was just like every weak, out of shape, non-hacking cop who hated DT training (more on that later) that I'd ever taught. I felt like a failure because all of my training and abilities developed over a decade was worthless. I punched him, kicked him, wrenched joints out of sockets, felt bones give way and still he kept coming until the cavalry arrived--and no, the carotid restraint didn't work and what was a TASER in those days? I resolved to never teach again because I couldn't live with the fact that I was a fraud. Sure I could fight with other “trained” fighters, but in the “real world,” what I knew didn’t work. I woke up a day or two later, sore, realizing that every technique I tried, and the other guys later attempted, failed because this guy didn't give us the chance to have the technique unfold. That rather than what I had been taught and was teaching that fighting was a logical progression of application of technique to handcuffs or victory, that fight and every fight that lasted more than one or two punches was, instead, prosecuted through problem-solving process!!! And that I had actually gotten through that fight until we had enough bodies to overwhelm him through a primal application of some of the principles I'd been teaching my cops. It was then things began moving fast in developing a principle-based, problem-solving, non-technical DT concept/program. The program was completely overhauled. I later took a job at a state training facility where I had 60 veteran officers from all over the state, country, and foreign countries for a week of training. I eventually had them for 8 hours of DT, 12 hours of firearms, 4 hours of building search, 8 hours of scenario training out of the 40 hours (which is where the concept of integrating all training under principle-based concepts and tactics took hold for me). With this population as my lab rats, I was able to get feedback from veteran officers about what was relevant and (a lot) about what sucked (they weren't shy). Refinement led to refinement. I then took a job as a civilian trainer at a PD where I had my own captive lab rats. Even more refinement took place. After a few years, my wife and I decided to go into the private sector. I was busy running around thinking I was teaching ONLY principle-based DT with NO techniques until Thomas Benge came on to our staff. Big Tom, after a couple of years of my mentoring, asked me, "Do you realize you are teaching techniques?" I didn’t say it, but inside I thought, “WTF?” I wanted to be offended, probably because of the truth of that statement sucked the air out of me. As he explained his concerns, I realized at that moment that while I was preaching principles and problem-solving, there was a large portion of program that was being advertised as principle-based but was actually being taught through the vehicle of techniques. I was embarrassed and very troubled. Tom and I went back to the drawing board and I realized what he said was true. So we became radical in our non-technical instruction. At this level of my understanding (which may not represent the “Truth” with a capital “T”), we have no techniques at all in our system: principle-based problem-solving employing simple, uncomplicated, primally blueprinted, hardwired, human-based solutions that officers find through their own efforts on the floor. Go back to the first paragraph about huge obstacles in changing individual and industry paradigms. It took me almost 20 years of development and thinking that I was teaching principles only to find that I was still teaching from a prescriptive perspective via "techniques" made up to look like principles and problem-solving. Why? Because the technique handed down by the instructor who is the all-knowing-authority-with-the-answers was so deeply embedded in my understanding of instruction that I couldn't see my cognitive dissonance. Without Tom's insight and courage to challenge and confront me, I would likely still be spouting off the techniques as principles. I mean no disrespect to anyone because I have been there and done that on this journey. With that said (and it is heartfelt), I have been on training floors, or I've seen videos, of individuals who are incredibly well-versed and grounded in human factors concepts--even to the point of being able to speak to Ph.D researchers nearly as peers--who still are hup-hup-hupping techniques on their training floors or firing ranges. In fact, I know and completely respect a researcher who also fits this description of knowing human factors inside and out and still advocating techniques in training. Why is there such a cognitive disconnect between what we know to be true (human factors, the ineffectiveness of techniques/prescriptive training, how humans actually fight, etc.) and what we actually do on the training floor and the range and in officer safety and for SWAT and...everything ("OK...Fit Flap A into Slot B. Now grab projection C and twist that around the B flap, causing his body to turn 90 degrees. Now step with your left foot 132 degrees to the left and 18 inches back. Reverse the polarity of your hands while bending slightly at the waist, pull with the left hand while holding your right rigidly and he goes down in perfect cuffing position. Simple, right? Works like a charm every time if you are as good as I am--except if YOU do it wrong.")? This huge dichotomy between what these advanced students of human factors know and what they do is not their fault because they cannot see the gap. I know I couldn’t see it until someone I implicitly trusted smacked in the face with my dual operating system that was in complete conflict. The mindset of the "solution as prescribed technique" and "instructor-as-authority" embed into our schemas is so deeply held that we, as humans and instructors, fall back to what is familiar and comfortable. We may even be on that floor speaking like a Ph.D in human factors and immediately teach something as a technique that directly conflicts with what we just said. It’s not hypocrisy. It’s not being able to step outside of ourselves long enough to see the problem—an intrinsic weakness of being human. It’s not hypocrisy. It’s not being able to step outside of ourselves long enough to see the problem—an intrinsic weakness of being human. Some have projected this to be just letting everyone do whatever they want and run willy-nilly around the floor doing nothing...IT'S CHAOS! THE END OF THE WORLD IS NIGH! EVERYONE DOING WHATEVER THEY WANT WHENEVER THEY WANT! ARE YOU MAD??? FLEE, FLEE FOR YOUR LIVES FROM THIS MADNESS! Frustration is part of learning and it takes experience to ensure that frustration does not build into defeat and turn into defiance. Instruction through guidance often consists of pointing out how some officers in the class have discovered pieces of the solution using the principles. The example of a peer finding a piece of the solution helps to guide them to the solution they need. The instructor becomes guide rather than authority. That is one of the toughest parts of training instructors to give up techniques and to guide our people to their own solutions. How do I give up being the authority? That's the question we all have to answer if we want to abandon ineffective and wasteful technique-training and adopt a human factors-based training system where you present and offer ZERO TECHNIQUES (that the officers won't be able to perform under threat or pressure and requires suspect cooperation). It’s a radical concept that forces us to be radical in our approach to training so our students can be successful in an unforgiving environment. It’s no secret that ammunition is both expensive and scarce, negatively impacting law enforcement and civilian shooters—if there is no ammo or it breaks our budgets, there is no training. But we still have to train, and, as instructors, train our officers. In light of ammo problems, the question is how? Dry-fire can be an answer, but traditional dry-fire with unloaded weapons has serious drawbacks. Unintentional discharges are a real possibility. Additionally, training scars occur in having to manipulate the slide following each trigger press (because when the trigger is pressed and a loud click is heard, the instant reaction should be tapping the magazine, not cycling the slide to reset the trigger). The question remains: how do we provide the training we need in a safe, economical, and effective manner? Each trigger press results in a highly visible laser dot on the target (available in a green laser for outdoors or red for primarily indoor use). The shooter (and instructor) receives instant accuracy feedback on each trigger press regardless of whether you are target-focused or front sight-focused. Using the SIRT Laser Training Pistol, powered by a standard CR123A battery, shooters maximize their training in trigger mechanics, grip, stance, and accuracy with a realistic weapon utilizing a realistic trigger. While ideal for individual training, all SIRTs have an additional built-in instructional function. A toggle switch on the top of the non-reciprocating slide provides feedback from two lasers: first, a laser “trigger take-up indicator” when the trigger finger takes up the slack, and the second laser shot indicator. The take-up indicator’s laser dot is adjusted below the shooter’s line of sight, letting the instructor observe not only when the shooter contacts the trigger, but also if there is both proper sight alignment and sight picture before the shot. All of the fundamentals, including precise trigger mechanics, are reinforced by the instant feedback of the laser’s dot. Trigger problems are instantly identified when the dot is off-target. Forget diagnosing bullet hits on targets. Incorrect trigger presses show up as “dashes” rather than “dots” on the target, requiring the shooter to focus on improving trigger manipulation, grip, and follow-through. The direction of the dash shows the direction the shooter is pulling, pushing, heeling or otherwise moving the weapon during the shot. There are three models offered, the “SIRT Pro,” and two “SIRT Performer” models. The Pro model has steel construction surrounding the electronics (housed in what is normally the slide). The Performer models are of polymer construction. If I were spending scarce training equipment dollars, there is no question that I would go for the SIRT Pro’s solid construction and resulting capability to withstand abuse by officers. Far from being a toy, this is a robust training tool that will take the rigors of combatives training. While anything can break, you’d have to work pretty hard at it with the Pro model. In defensive tactics (only the Pro model is recommended for DT training), the green shot indication laser dot on the “suspect” provides hit feedback far better than a red shot indicating laser while the dual laser provides trigger contact feedback to instructors. On the live-fire range, the SIRT can substitute for repetitions between live-fire (saving ammunition while getting trigger presses and accuracy feedback), as well as for safety rehearsals when moving. In scenario training, there is no possibility of injury (the lasers are eye-safe) or damage to property, no clean up, and each trigger press is estimated to cost less than $0.0002 through the life of the $3.00 battery. In the time I’ve taken to write this review, I’ve had instant visual feedback on no less than 40 deliberate trigger presses and over 100 rapid fire trigger presses on various targets strategically placed around my office (single targets, multiple targets, a hostage target, and targets behind simulated barricades, all at various angles, distances, and sizes). On a normal work day, I get 150 to 300+ quality trigger presses with absolute safety because live ammo cannot be loaded into the SIRT and with no need to manipulate a slide between each shot to reset the trigger. Gone are the days of dry-firing my “empty” duty gun at the TV (to my wife’s relief). If this is not enough, I often get up to 50 magazine changes per day using the SIRT’s weighted magazines. After four decades of intensive shooting and teaching shooting, the SIRT has revealed some of my previously hard to diagnose problems (I’m evidently good at hiding bad habits, even from experienced trainers). The laser is unrelenting in its feedback, even more so than live-fire because there is no muzzle blast, bullet, or hazard to worry about. It is just the mechanics and the laser dot (or the dreaded dash). There is no other explanation for the improvement of my shooting other than the time I’ve put into the SIRT. With all of the training benefits, the rugged construction, and the miniscule cost per trigger press, there is just no argument against NextLevel Training’s SIRT Laser Training Pistol. This is one in a series of "Why Do We Teach?" articles focusing on training subjects in police academies, in-service training. Not just police related, these concepts and methods are often commonly taught. The series details why we either teach that concept, modify it, or reject in favor of a more practical solution. If you teach it, it must be defensible, pragmatic, applicable to real-life combat and survival, and lawfully justifiable. Handgun shooting stances are taught to shooters and reinforced through hours and years of training. Creating a stable shooting platform, from the soles of the feet through the hands, is necessary to obtain the hits on the target or, more vitally, on the Threat. Stances are performed with the legs comfortably bent, spine with a bit of a forward lean, with the arms either pushing and pulling, creating the dynamic tension for which the Weaver Stance is known, or pushing the hands forward symmetrically to form the Isosceles Stance. It is important to focus upon a proper stance in order to be more successful in surviving shootings, right? Well, no, not really. Early formal stance training may be useful to a developing shooter. However, concentrating on perfecting a stance is generally counter to prevailing in a shooting. Most shootings take place in extremely close distances involving very large targets, are very abrupt, and extremely violent. Many officers find themselves in awkward positions when the gunfight begins. Tactics are much more relevant to your survival than your stance. The mere mention of a “stance” automatically causes the legs to form a solid, well-balanced base supporting the upper body as it fires the weapon. Marksmanship requires a strong foundation. However, accuracy, and thus marksmanship, is contextual. In most gunfights, what the legs are doing is irrelevant to marksmanship needed to survive. Training to stand solidly in the open and trade shots with a murderous Threat is a sucker’s game—every bullet fired in your direction may end your life. While being a static target may theoretically have the possibility of increasing your accuracy, being a stationary target definitely assists the bad guy with his marksmanship and putting bullets through you. Standing still with bits of red hot lead zipping past while being thumped by muzzle blast generally decreases any shooter’s accuracy potential. The more vulnerable you perceive you are, the less physically and mentally functional you are likely to become. Accuracy is more a factor of being able to cope with and overcome your perception of immediate personal vulnerability. While you are not likely to instantly affect the Threat shooting you (most bullets take time to cause the body to react), you can create a sense of more time that may increase your ability to lay sufficiently accurate fire on the Threat to save your life. The tactical responses proven to likely increase your survivability is either sudden angular movement or moving to a corner and fighting from there. Static stances have no place in this lethal environment when you are behind the Threat in the gunfight and need to stretch time to effectively respond. Developing the capability for precise fire is a necessary skill for any shooter. However, precision is rarely called for in an actual shooting. “Combat Accuracy” is all that is necessary for survival. Paraphrasing Rob Pincus, combat accuracy can be defined as “Any round disrupting the imminent threat to life.” This may mean a bullet strike to the brain or spine, a hit in the upper thoracic cavity, the pelvis, or any bone. Sometimes just simple “minute of human” accuracy to any part of the body is sufficient, but no single bullet can be counted on to stop the fight. For the balance of this discussion, let’s assume that the legs are doing their thing independent of the upper body’s efforts—this may be moving, crouching, or kneeling. Therefore, this discussion will be about a Modified Weaver or Modified Isosceles and their contextual usefulness. The position of the arms in the Weaver Stance, characterized by the push-pull tension of both hands on the grip of the handgun, arguably provides a very stable platform for accurate fire. This shooting method was popularized by Lt. Col. Jeff Cooper as the “Modern Pistol Technique,” permitting more precise shot placement at small targets at any distance. Fundamentally, the body is bladed and the shooting elbow is locked straight, with the gun-hand pushing the handgun forward. The support-hand’s palm contacts the shooting hand’s fingers, pulling directly back with the elbow bent and pointing downward. Many have been taught to shoot with their shooting elbow bent and pushing forward. This is an error. Instructors attempting to mimic Col. Cooper’s shooting style are apparently unaware that a combat injury prevented him from extending his arm. He taught others to straighten their gun-arms. The FBI’s “Violent Encounters” study (2006) revealed that more than 97% of shootings begin with the suspect shooting first. A human’s “startle response” to surprise results in spinning to directly face the threat, hands up at face level and extended to protect the eyes and throat, with the spine forward in a semi-crouched position. Problematically, human factors and the Weaver-hold are counter to the body’s reactions in a sudden shooting situation. When wearing body armor, the Weaver stance also presents the non-dominant side’s arm hole to the Threat. Because the Weaver can only be properly employed in a bladed stance, the strongest part of the body armor (center chest where the shock plate is located) is in an irrelevant position, with the unprotected armpit placed in the most vulnerable position. Wounds from bullets traversing the body laterally through the axillary region, that is, from side-to-side through the armpit, are incredibly threatening to survival because they tend to pierce multiple organs and vital blood vessels of the upper thoracic region. The Weaver-hold is ideal when fighting from a corner. With most of the body covered by the barricade, the stability of this hold is put to use making longer distance or precision hits. Corners give you time. Marksmanship is all about having the time to put the bullet on target. The Modified Isosceles is a reactive “stance.” The Isosceles (upper body square to the threat, hands pushed forward at eye-level, the legs doing what they do in that specific situation) reflects how humans naturally react when faced with a sudden close threat. The upper body of the Isosceles mimics the natural startle response, as seen in video after video of officers responding to real-life threats by punching their handguns out in front of them. It is a human instinct to put a weapon between you and the perceived threat. While generally not as inherently accurate at distance as the Weaver hold, it doesn’t have to be. Combat effective accuracy requires only hits on target, preferably in most cases, with bullets impacting within three to six inches of each other, creating as much damage to multiple organs as possible. At close distances where the Isosceles-style will likely be employed, a high degree of accuracy is generally not necessary for survival. Hitting him well, quickly and often is more critical to winning. If wearing a ballistic vest, the Isosceles-hold keeps the center of your vest facing the threat, affording you maximum protection. It also supports moving and hitting much better than its well-known counterpart. When the shooter moves in any angular or lateral direction, the Isosceles-hold supports hitting until the angles become too severe, forcing the shooter to transition to a one-hand hold. Where’s the Threat? Either close or far, big or small. What’s his weapon? Firearm, blade, or striking implement. What’s he doing? Charging you or standing. Grabbing you or behind cover. Where are you? In the open, behind concealment, or behind cover? Are you surprised or did you have enough time to prepare? If you had time to prepare, you are likely behind a corner with a firearm in-hand. These questions will likely not be answered so much as reacted to. Realistically, this decision is not made as it is a reaction per your training to the situation suddenly erupting in front of you. All plans are made for flat terrain and sunny weather regardless of the ground-truth. Having a rigid plan to engage in a gunfight with a certain weapon hold and stance is not realistic. Training and expectations of “how it’s going to go down” may not match your immediate needs—especially so if dogma has any part in your decision-making. Desperately clinging to a “style” or “method” may mean that you are attempting to drive a nail with a screwdriver in a life-and-death situation. While a screwdriver is a fine and necessary tool, it cannot be applied in every situation. The same is true of a shooting stance where dogmatic adherence to a “style” due to guru-worship or personal ego-investment may leave you confused, unable to effectively respond, and perhaps horribly injured. If you’re suddenly attacked at close range and are purely reactive, you’re most likely to shoot (and hopefully move) in some form of a Modified Isosceles platform. From contact to rock-throwing distances, movement is the highest initial survival priority—hitting him is a very close second. However, if you are fighting from a corner, employing the Weaver platform is more likely to get the needed hits, especially if the Threat is at distance or behind his own cover. Fighting from a corner creates the perception time, and if you have the time to make a precision shot, Weaver may help you obtain that hit. Categories: Firearms | Training | Why Do We Teach? Many handgun shooters use the “Sul” Position” as a “combat ready” position, both on the range and in the street. The Sul Position is characterized by the weapon hand being held close to the torso approximately at solar plexus level, muzzle down, with the support-hand in various positions as needed or trained. The muzzle is intended to be directed just to the side of the lead leg to comply with safety rules of never allowing the muzzle to cover anything you are not willing to destroy or kill. It is also presently fashionable as seen in many magazines and training videos. So it makes sense to train cops or responsible citizens to use the Sul Position as a safe combat ready position, right? Well, no, not really. The Sul Position is not suitable as a combatives ready position, and was never intended for that purpose. Often, when something becomes a “position” or “technique”—especially when someone gives something everyone does a name—it becomes both fashionable and misunderstood. Doing anything because someone else does it without knowing why they are doing it that way can lead to wasted years of training, or worse, tragedy, injury, and sometimes loss of life. The Sul as a ready stance decreases efficiency of the weapon’s presentation and can create a safety problem. “Sul” is Portugese for “south,” and was originally developed in Brazil. The original intent was to provide a safer way to move with a handgun in-hand through a crowd or past a person without muzzling anyone. How it works: From a practical ready position with the handgun in a one- or two-hand hold, muzzle directed toward the threat area, the Sul is performed by bringing the weapon to the torso with the muzzle directed downward, or south, and pointed off to the side of the support-hand’s leg (if in the right-hand, the muzzle is directed down and just to the side of the left-leg). As the muzzle moves downward into the Sul, the support-hand either comes off the grip and flattens naturally, palm down on the torso (ready to quickly move into a two-hand grip), or it comes up over the weapon, covering it. The support-hand is available to reach out and grab a subject if the situation demands (never the first choice with a firearm in-hand, but being forced to go hands-on with a threatening or resistive subject happens far too often to be ignored or simply dismissed by saying, “Never touch anyone with a gun in your hand”). Your support-hand may reach out and touch a person you are moving past, ensuring you know their position, to let him know you are moving past, and making sure he doesn’t move unexpectedly. If moving through a crowd, the weapon moves into a safer muzzle position against the body, and the support-hand moves to cover the weapon as the first line of defense against weapon retention threats. The support-hand comes off the handgun as needed to guide others, creating a path to quickly move through the crowd while still having the handgun in-hand. As quickly as the support-hand moves from the weapon to reach out, it comes back, covering the weapon as the shooter continues to move. When the shooter is past the individual or through the crowd, the muzzle comes up and the weapon again floats away from the mid-torso, pointing wherever the shooter needs it for quick response to imminent threat. Because so many lawful shootings in defense of life are an immediate response to a reasonable perception of imminent threat behavior, everything the shooter does must be efficient to obtain first rounds hits on target—as well as each subsequent round. Hits are the only thing that counts in a gunfight, and looking good in a cool stance or weapon hold just before you die doesn’t. Neural pathways (muscle-memory) are created by doing the same efficient movement the same way, getting the same consistent results. The Sul cannot support habits of efficient weapon presentation because it was never intended to be a “Ready Position,” and its fundamental presentation mechanics are faulty. Flipping the muzzle. A “ready position” facilitates the weapon smoothly—and rapidly—interrupting the eye-target line with the muzzle (actually, the bore-axis) aligned with the threat and with minimal disturbance to that critical alignment, ready to put a bullet into the target. The handgun in the Sul Position is both flat against the body and the muzzle is down. 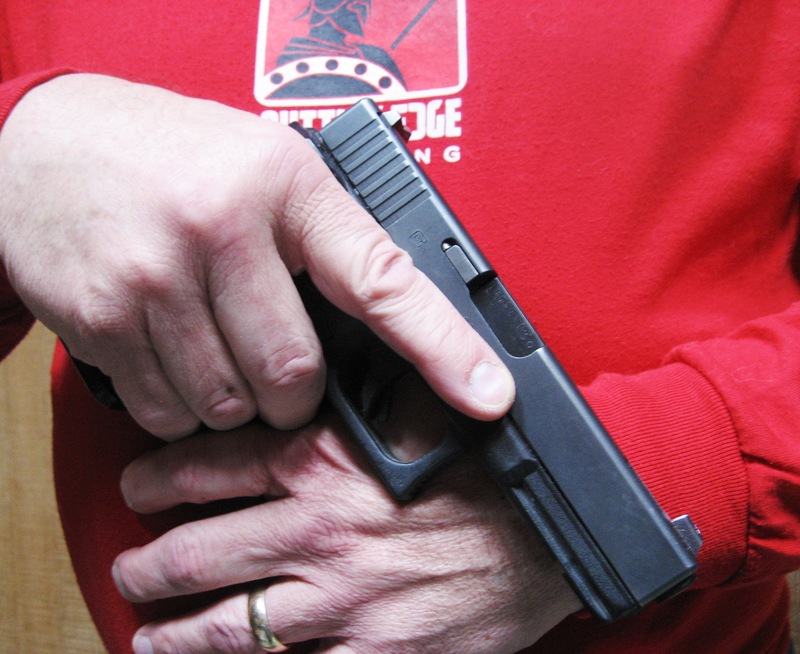 As the handgun is brought up and punched out, the shooter must accomplish a lot more than just presenting the weapon to the target. The handgun must rotate in two directions—laterally and vertically—while speeding to get on target. While a three-pound weight held in your hand(s) at the end of your arm(s) doesn’t seem like much, the rotational forces while punching out all combine to create the critical problem of precisely controlling muzzle flip. Flipping the muzzle creates muzzle over-travel and inconsistent first round hits. Rigidity in the body, shoulders, and arms. Creating a technique creates mental mind-games in many shooters. It is not unusual to see shooters on the line, handgun in-hand in the Sul Position, waiting for the execute command, their entire body rigid, elbows held out at their sides and sometimes unnaturally forward. This becomes a variation of a position of attention, locked both mentally and physically. Brain studies show that if we are “doing something,” the brain must first tell the body to stop “doing this,” and then find the neural pathways to tell the body to begin “doing that.” This is measured in tenths of a second for each command—first to stop, and then to begin. Ready stances should be relaxed and as natural as possible. Muzzling one’s body parts. There are safety issues with this position as it is normally practiced. It is not unusual for a shooter using the Sul to muzzle body parts, whether a foot, leg, or, um…other highly valued body parts. When the Sul Position becomes a ready position, it is easy to lose track of the muzzle because the eyes are downrange watching the threat target or searching for one. The most common safety violation we see on the range is from those trained in the Sul pointing their weapon at their own bodies. There is nothing wrong with moving the muzzle in any direction safety demands. On the range, that’s easy—downrange where the backstop is located. On the street, that can be problematic. Cutting Edge Training’s Master Trainer, Thomas V. Benge, developed the idea that the weapon should be pointed in the “safer” direction—the area where the least amount of injury or damage will occur if the weapon is discharged. Sometimes that direction will be downward depending upon the context of the situation. Sometimes its safest pointing at that person you might be forced to shoot. We suggest a “floating” ready position, that is, the weapon floats to and away from your body as the situation demands, pointing at the Threat or possible threat location until it is safer to point somewhere else. With the weapon lightly gripped in your dominant-hand while traveling from one point to another toward the suspect’s threat’s location, both hands on the weapon, your upper body is loose and relaxed. Loose muscles move faster than tense muscles (fewer neural commands seeking pathways to achieve movement). As your perception of threat increases, your grip will tighten as the weapon naturally floats out farther from your body toward the threat. We also see the weapon getting higher, nearer to the eye-target line. Upon challenging a possible threat, your arms move to near maximum extension below the eye-target line, generally in the crotch/belt buckle area as you make shoot/no-shoot decisions. The muzzle is on the subject. This allows you to see his hands and waistband. This is a deadly force warning that, if the circumstances permit, will likely be accompanied by an oral warning to comply. If the perception of imminent threat to life is sudden, the weapon is quickly pushed forward and brought up, interrupting the eye-target line well before the arms are extended, and the trigger depressed as the weapon is slowing to a stop. Rather than a fixed position, the ready position moves as the situation changes. The weapon moves up and down, left and right, away and back until it is punched out as a warning or a deadly force response to a reasonably perceived imminent threat. The concept of the Sul is absolutely valid—it just is not useful as a “ready position.” If crossing, either an uninvolved person, a teammate, or through a crowd, the weapon moves against your body, muzzle pointing down and away from body parts, with the support-hand either touching, grabbing, or moving someone, or covering the weapon. The Sul is useful until it is again time to point the weapon in a safer direction—the suspected or actual position of the Threat. Cops fall, especially when working in the dark. Everyone’s been injured to some degree at some point in their career from falling. Stepping off a curb you didn’t know was there, finding a hole in the ground while walking across grass, being pushed over a coffee table, walking on ice or slippery surfaces, or falling up or down stairs, doing anything in the dark, being taken down during training—all can result in your going down hard to ground. So it makes sense to train cops in martial arts rolls and breakfalls, right? Well, no, not really. It is actually a waste of very valuable training time. The training of recruits as well as in-service officers in defensive tactics involves a great deal of material that must be mastered in very little time. Unless a recruit or officer already possesses an athletic background involving rolling or tumbling, or is an experienced martial artist, training time devoted to rolling and breakfalls cannot achieve the desired goal of inoculating these individuals from injuries from falls. The limited time available to create minimal competence in defensive tactics and arrest and control is simply insufficient to gain mastery—or even competency—in the ability to prevent fall injuries later in their career. Absent their own independent training and practice, the typical officer will never again practice rolls and breakfalls to the point where it becomes unconsciously automatic during an unexpected fall. Spending ten hours in the academy learning how to roll and breakfall without continuing practice is ten hours that might be spent learning a skill or tactic that might later benefit the officer’s survival. In the martial arts, “how to safely fall” is routinely taught to decrease the injuries from training as well as to provide a safety mechanism when the student is sparring. Training often begins with basic shoulder rolls, and then to break falls until the student is capable of safely falling from a hard throw on to a mat or even on to an unprotected surface. As the training progresses to increasingly more difficult and dangerous throws, different and more effective breakfalls are needed, practiced, and mastered. Martial arts training involves years of consistent and regular training to achieve competency in fundamental tasks that also involve rolling and falling. Dedicated personal training effort creates an unconscious mastery. This permits an individual to automatically roll or break their fall when they unexpectedly lose balance. Absent this type of intensive and extended training, no one can be considered to be skilled in safely falling from the number of hours and repetitions received solely from academy or in-service training. Martial arts training involves years of consistent and regular training to achieve competency in fundamental tasks that also involve rolling and falling. Dedicated personal training effort creates an unconscious mastery. This permits an individual to automatically roll or break their fall when they unexpectedly lose balance. Absent this type of intensive and extended training, no one can be considered to be skilled in safely falling from the number of hours and repetitions received solely from academy or in-service training. Because Defensive Tactics training seems to be a natural result of martial arts training, almost all academy curriculum contains varying amounts of time dedicated to teaching recruits how to fall. For example, a new DT curriculum for police recruit academy training was being developed by a Defensive Tactics Subject Matter Expert who asked for my review. The first subject was “Rolls and Breakfalls.” When asked why the recruits would be spending eight per cent of the course on developing this skill, this highly experienced police officer and very accomplished martial artist answered that every cop needs to know how to protect themselves from falls on the job. For him, the need for this training content was automatic, something intrinsic to his deep experience in martial arts. This brought on a line of questioning that became increasingly more difficult to justify. When finally asked if he thought, absent previous training, the recruits would gain automatic, unconscious competency from this time spent in this activity, he thought, and then admitted that it was very unlikely. His assumption, that every officer must be able to protect from fall injuries whenever and however they might occur may be valid. When faced with the reality of the limitations inherent to recruit and police training, that standard is not achievable. Officers leave the academy and are instantly in the big leagues--officers have been murdered on their first day of patrol. The non-martial artists, representing most recruits and officers, have little time to prepare to face every manner and threat of suspect. Cops are many times more likely to become involved in a physical fight than a shooting, and much more likely to be sued for the simple application of control holds than they are for shootings. Defensive tactics training, regardless of how much time is allotted to it, is by definition less than desirable for any officer. There just isn’t sufficient training time in any agency’s budget or schedule to commit the personnel to gaining anything more than minimal competency. Every topic in any defensive tactics program must be scrutinized for its realistic value to the officer on the street. This is measured by the average officer’s ability to successfully apply the skill or tactic on-time, in-time against an unwilling suspect. This requires the training to provide sufficient time and repetitions to minimally acquire a level of at least conscious competency (although this is not “mastery,” officers can perform the skill or tactic but must think about how to do it). Will an officer who is three years out of the academy, being assaulted in the dark and shoved off-balance, be able to remember and perform that skill? Frankly, the typical officer will not be able to execute a safe fall or roll during an unexpected fall. If that is the case, why teach this topic in training? Teaching martial arts rolls and breakfalls are a poor use of time when they are viewed from the officer’s very real need for functional knowledge at some distant time. There simply is not enough time or the availability of frequent, recurrent training to gain even a minimum level of competency when reacting to suddenly falling or being thrown in a fight. Even if that time and training budget were provided, there are other skills that would be more beneficial to an officer’s survival than rolls and breakfalls. Simple breakfalls should be covered to assist in maintaining the safety of the recruit or officer being taken down in training. Explanations and practice of a simple PLF (Parachute Landing Fall) where the goal is to sequentially collapse the body without striking bony projections (knees, hips, elbows, shoulders, and especially the head) against the hard surface of the ground, will be better incorporated into training. Through this, training is simplified and made safer. A level of competency might then be gained during the repetition afforded by takedowns in practice. The recruit should receive several hundred repetitions of the same or similar fall during the course of the training. The simple fact of hundreds of repetitions of more safely falling increases an individual’s expertise, and may lead to a behavior change in the future. However, more advanced breakfalls from throws, as well as martial arts rolls require an intensity and duration of practice that will never be provided by police training. They are too varied and specialized, and this limits the number of reps that recruit or officer receives. That time can be better spent elsewhere during this precious training time to develop their expertise on something that might actually later be useful. Categories: Training | Why Do We Teach?